A tetradrachm o Tigranes II. The starn seembol atween the twa eagles on his croun mey depict Halley's Comet. 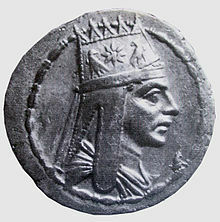 Tigranes II, mair commonly kent as Tigranes the Great (Armenie: Տիգրան Մեծ, Tigran Mets; Auncient Greek: Τιγράνης ὁ Μέγας Tigránes ho Mégas; Laitin: Tigranes Magnus) (140 – 55 BC) wis Keeng o Armenie unner whom the kintra acame, for a short time, the strangest state east o the Roman Republic. He wis a member o the Artaxiad Ryal Hoose. Unner his reign, the Armenie kinrick expanded yont its tradeetional boondaries, allaein Tigranes tae claim the teetle Great Keeng, an involvin Armenie in mony battles against opponents such as the Parthian an Seleucid empires, an the Roman Republic. ↑ Gurzadyan, V. G.; Vardanyan, R. (August 2004). "Halley's comet of 87 BC on the coins of Armenian king Tigranes?". Astronomy & Geophysics. 45 (4). doi:10.1046/j.1468-4004.2003.45406.x. ↑ Manaseryan, Ruben (2007). Տիգրան Մեծ՝ Հայկական Պայքարը Հռոմի և Պարթևաստանի Դեմ, մ.թ.ա. 94–64 թթ. [Tigran the Great: The Armenian Struggle Against Rome and Parthia, 94–64 B.C.] (in Armenie). Yerevan: Lusakan Publishing. p. needed. This page wis last eeditit on 5 Apryle 2017, at 02:16.